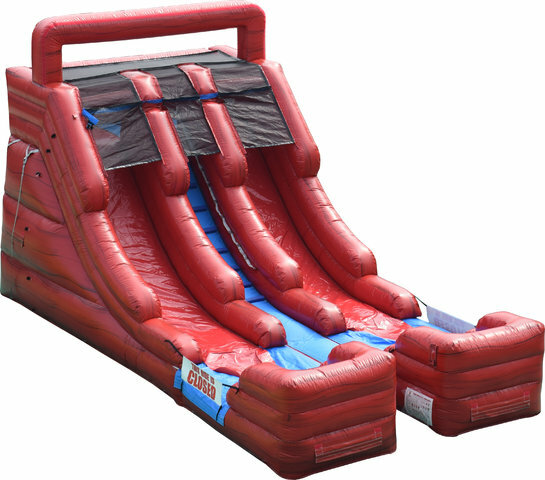 Check out the 15’ Red Marble Double Lane Water slide, an expansive inflatable with a fiery design that is sure to catch the attention of all your guests! The red-hot shades serve as an exciting contrast to the refreshing slide, which funnels guests into the inflatable pools that sit at the bottom of the unit! Standing over 15’ in height and spanning 32’ in length, the 15’ Red Marble Double Lane Waterslide is a sight to behold! Reserve it for your upcoming celebration today! If you have a weekend party, let us know if one day earlier delivery works (when available), and be sure to include other delivery notes as well.